Enjoy a unique experience with a quantum shift in design, luxury, driving pleasure and innovative technology. Thanks to its chassis, the ES displays an elegant side profile, wide stance and low centre-of-gravity. Additionally, and its sleek coupé roofline notwithstanding, our executive sedan delivers legroom and space for passengers. Our ‘Takumi’ master craftspeople oversee all of the exquisite detailing, from the stitching on the seats to the sharp and seductive F Aluminium cabin trim, inspired by the beauty of a Hadori polished Japanese sword. Around the city, the breakthrough Self-Charging Hybrid will often switch to Electric Vehicle mode, producing no emissions whatsoever. 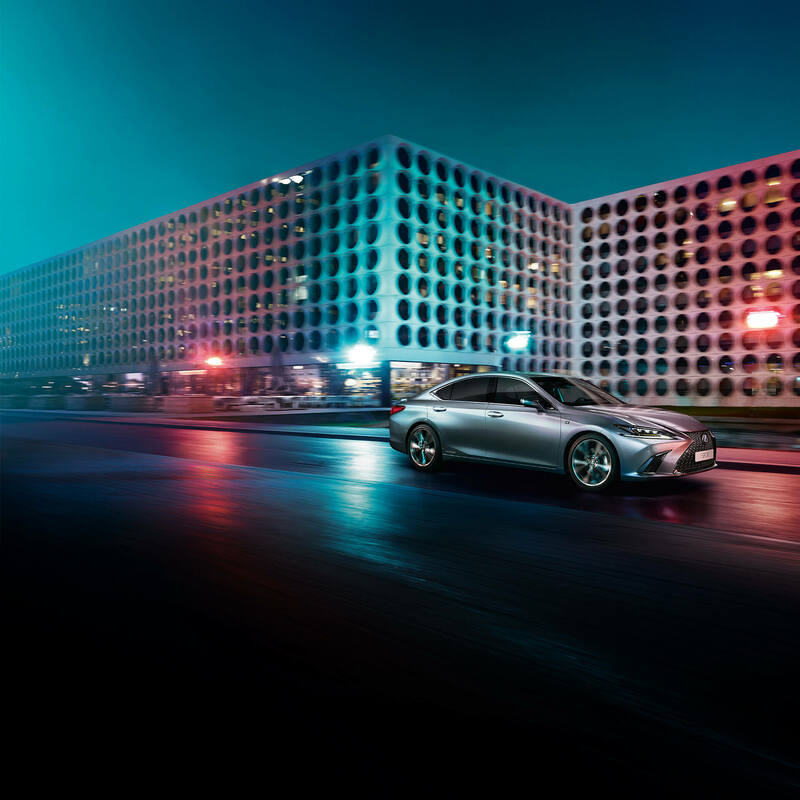 The 4th generation Lexus Hybrid Drive gives the ES incredibly responsive performance coupled with exceptional fuel efficiency. The Heads Up Display in the ES enables drivers to concentrate on driving. The Drive Mode Select switch has been placed beside the meter hood bezel so that it can be operated easily without changing the driving position. While advanced HMI (Human Machine Interface) functionality combines with an aesthetic design that offers intuitive and easy operability, linked displays with a sense of depth, and personalisation to suit individual preferences. Wherever you go in the new Lexus ES, it’s reassuring to know that you’re driving the safest premium sedan ever tested by Euro NCAP. After receiving a prestigious 5-star rating, the ES has since been awarded Euro NCAP’s Best in Class award for Large Family Car and Hybrid & Electric for 2018. The very latest Lexus Safety System + is comprised of advanced technologies that help prevent three of the most common accident types: rear-end collisions, lane departures and collisions involving pedestrians. Discover additional features including two colour choices, AVS as standard, front and rear dampeners, a rear spoiler, 19-inch wheels, a black cross-hatch pattern and aluminium inserts, including pedals. Begin tailoring the ES to your requirements, experiment with colour preferences, or continue onwards to explore features and the gallery. The first Lexus to feature ‘Mark Levinson® PurePlay’, the 17-speaker Mark Levinson® Premium Surround Sound system on the new ES features seven shoulder-height Unity™ speakers. These create a listening experience very close to that of a Mark Levinson® home system. The ES also features a 265 mm sub-woofer and Clari-Fi™ Music Restoration Technology, a program that performs analysis of the sound source data to restore just the right amount of elements, closely reproducing the original sounds and bringing the live sound back to life. The Lexus climate concierge orchestrates the ideal climate for each person in the car. If the sun is shining into the car from the driver’s side on a hot day, the system will control airflow and temperature to keep the driver cool, while avoiding excessive cooling of the passenger’s side. For your safety and comfort, a sensor detects cabin humidity, air and windscreen temperature, to ensure the windscreen does not fog up. Perfectly positioned for a relaxing drive, the ES sedan’s large 12.3-inch multimedia display can be operated by voice command or the new Touch Pad. Its split-screen capability allows you to simultaneously access information, such as Lexus Premium Navigation and climate data or enjoy the peerless concert hall sound of the 17-speaker Mark Levinson® Surround system. Using technology first developed for jet fighter aircraft, the ES’s high-resolution colour Head-Up Display is positioned unobtrusively in your field of vision and projects key information onto the windscreen. It creates an image so crisp and sharp you’ll have no problem viewing the data, even in the very brightest sunlight. This three-spoke steering wheel combines real leather with finely grained wood and fits snugly and comfortably into your hands. Available with heating for colder mornings, integrated switches control audio, telephone, voice recognition, multi-information display, Dynamic Radar Cruise Control and Lane Tracing Assist. A wireless charger inside the console box enables a portable device or smartphone to be charged by simply placing it on the charging pad, eliminating the need to connect a charging cable. With the latest Touch Pad technology all the functions on the new ES are easy to access. A control panel is provided on the rear centre armrest. Using the panel, the air conditioner, audio, rear seat heater, rear seat reclining, and sunshade functions can all be operated. To enhance comfort in hot weather a powered rear sunshade is available. Rear seat passengers can alter the shade for the rear, door and rear quarter windows. The smooth leather or semi-aniline leather seats on the new ES are an outstanding example of the highest levels of Japanese ‘Takumi’ craftsmanship. The leather is of impeccable quality and the stitching is executed with immense precision. The result is seats of exceptional beauty and comfort. LED cornering lights provide extra illumination to the area close to the car when turning left or right or cornering. Noise-reducing wheels with a hyper-chrome metallic coating. Wheel size is emphasised by five dynamic multi-spindle spokes. Enjoy the convenience of a hands-free power boot lid that opens as you place your foot under the rear bumper sensor while carrying the smart key. In a break with past generations, the design features a sleek roofline that emphasises the vehicle’s lower stance and smooth aerodynamics. Using the latest LED technology, the ES rear lights give the car an instantly recognisable visual signature with crystal-like linear illumination. In search of world-class refinement, a swing valve shock absorber has been engineered for the new ES 300h. Generating damping force for low-speed driving and motorway cruising, it delivers excellent steering response and stability, as well as ensuring superb ride comfort for all on board. Every ES has excellent aerodynamics, including a near flush under body, which not only contributes to good fuel economy but also reduces wind noise and turbulence. In order to prevent noise from entering the ES cabin, many steps were taken such as improving door seals, minimising holes in the chassis and upper back of the car, and optimising the body sealant and panel alignment. Already an exceedingly quiet car, Hybrid Acoustics™ on the ES 300h Self-Charging Hybrid uses a 3-layer dash inner silencer in which a noise insulation sheet is sandwiched between two felt layers. This means travelling in the ES is always a highly rewarding experience, even at higher speeds. Explore the exclusive features and flawless finish of the ES interior. Discover the ES from all angles​. Explore a life of luxury with the ES.